Today we have something special at Runway Inspired Challenge. 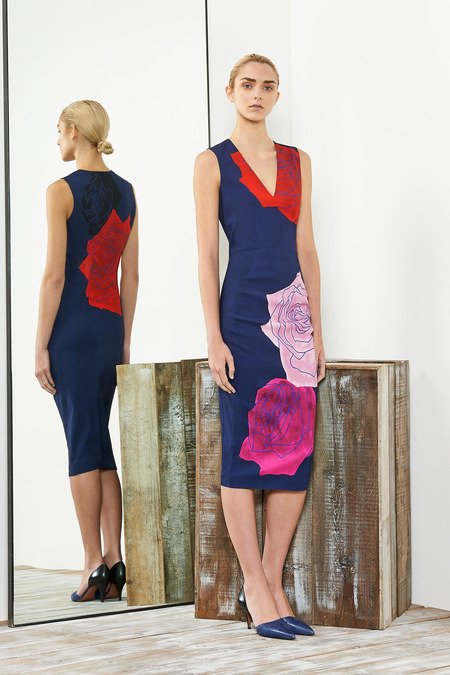 In honor of the famed and beloved fashion icon Oscar de la Renta, who passed away recently, the design team chose a favorite piece from his most recent collection to use as inspiration. I took inspiration from the fabric pattern and the flowers in the background. I used a cream color card base and stamped some botanical images in random places. 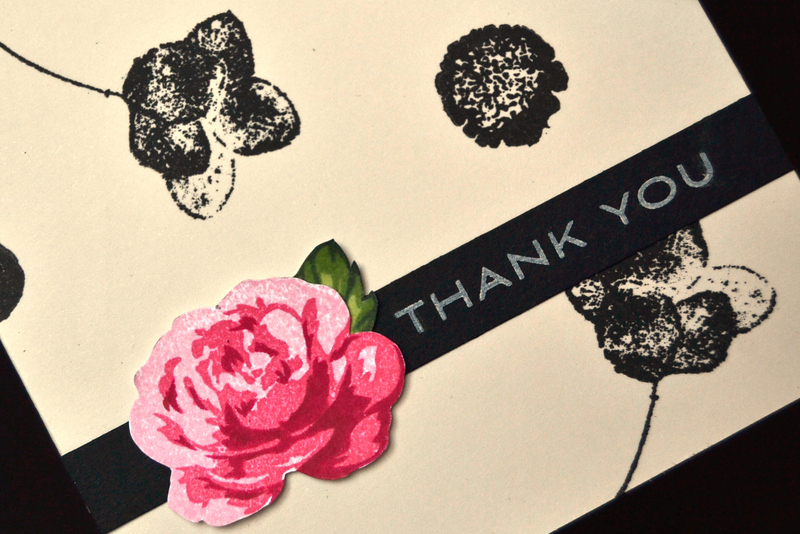 Next I adhered a strip of black card stock and stamped ‘Thank You using cream pigment ink. The rose was stamped and trimmed before it was adhered over the black strip. This round’s sponsor is Simon Says Stamp, and the winner will receive a $15 store credit to SimonSaysStamp.com. Make sure to stop by the Runway Inspired challenge to see what looks the design team chose for inspiration! You may choose any of these looks to make your project! Ink: Cloose to my Heart Vanilla Cream, Sweet Leaf, Topiary, New England Ivy Stampin’Up! Pretty in Pink, Regal Rose, Primrose Petal. 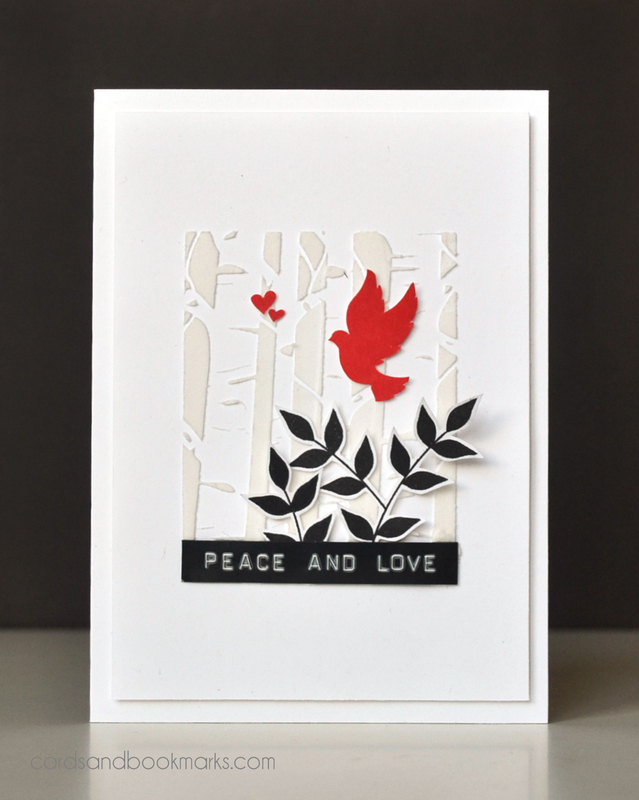 I used a stencil by TCW, and applied white embossing paste onto a piece of white card stock. Before I placed the stencil, I masked the borders leaving a rectangular window in the center. 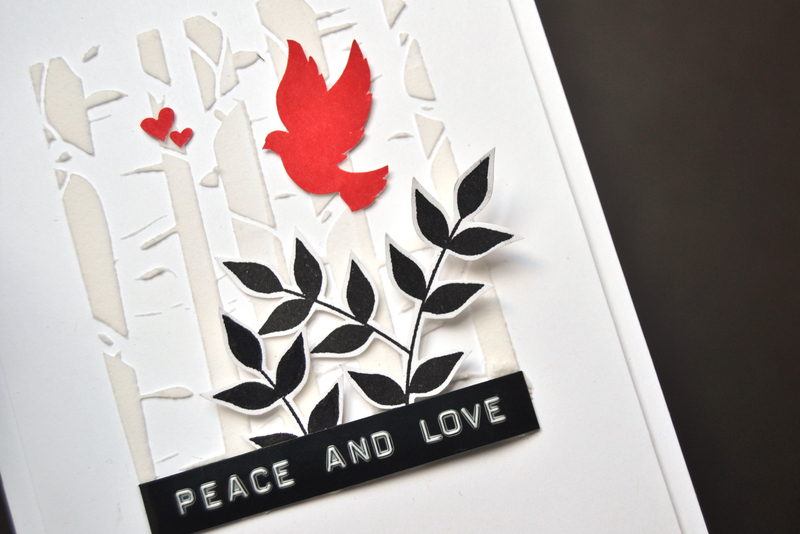 The dove and the hearts were stamped in red and trimmed with precision scissors. The leaves were stamped in black and trimmed leaving a white edge. The sentiment was made using a label maker. Our sponsor this week is Ellen Hutson, and the winner will receive a $25 store credit to her store! Stop by the Runway Inspired Challenge for more fabulous inspiration! Today I am joining Chaitali and her friends for a blog hop celebrating Diwali, the festival of light. I personally do not celebrate Diwali, but I wanted to join in the fun and learn more about this festivity. 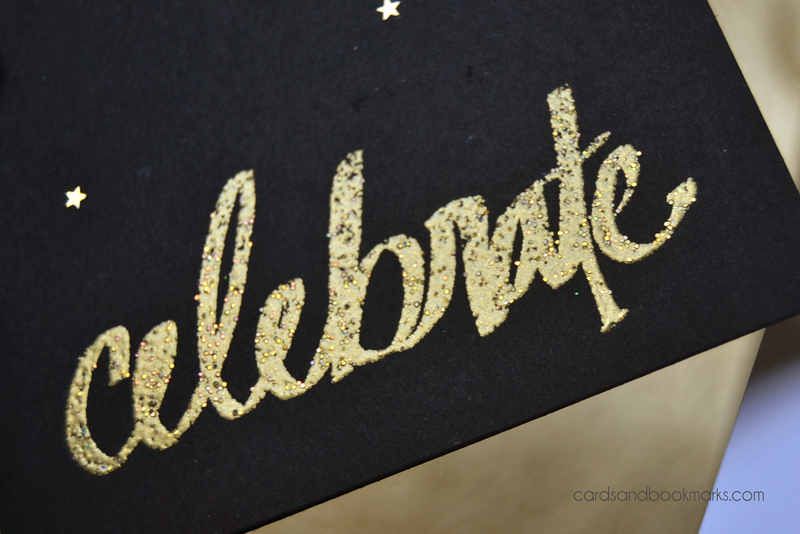 I embossed the word Celebrate from Altenew’s Super Script set directly on the black card base. 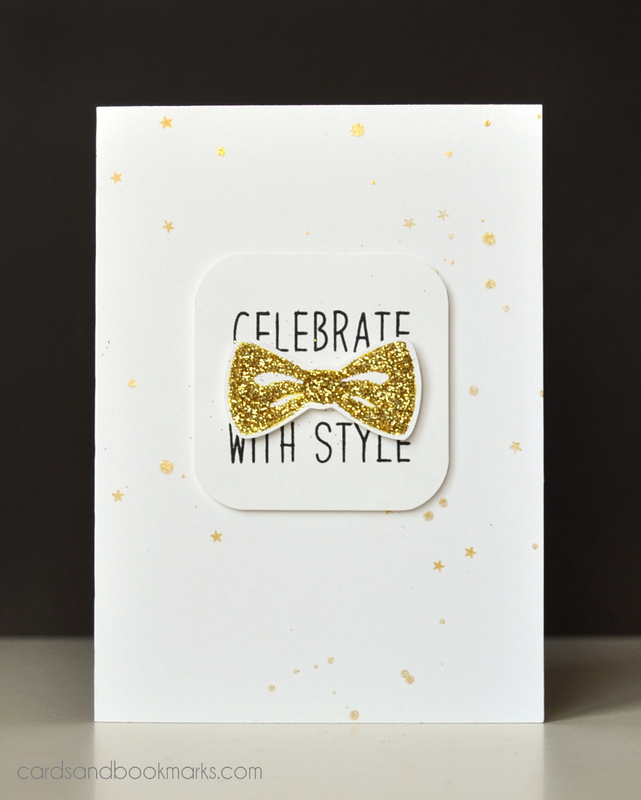 I used Ranger’s “Roman Gold” embossing powder, which is a combination of glitter and gold embossing powder. To add the star sequins, I placed dots of glue in random places, and placed the stars on them using a QuickStik. I think the tiny stars look like little speckles of light! In my next card there is a little sneak peek of an upcoming stamp set by Altenew! The leafy branches were sitting on my work top and I couldn’t resist using them! 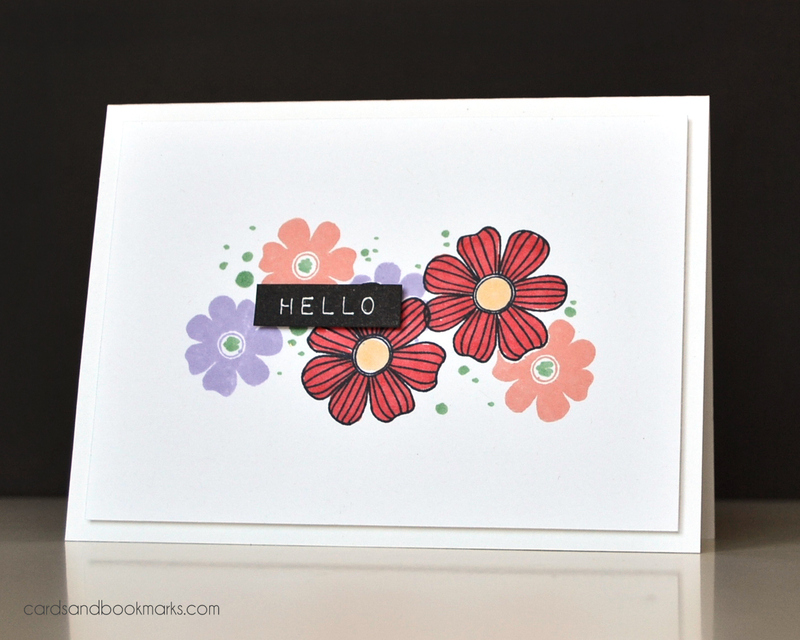 The flowers are from Altenew’s Scribbled Flowers set, and the greeting is from the Label Love set. Since Diwali is a celebration of light, I thought the card needed some gold/sparkly element. I added a shiny strip of gold tape, and a few drops of gold glitter to complement the tape. Notice that both my cards have the “celebrate” theme. With their sparkly elements, I think they will be nice cards to give to someone on Diwali, but they can also be used for other happy occasions. That is it from me! Join in and participate in the hop to learn more about the festival and see some beautiful ethnic creations! Your next and final stop is Neon Diary by Shipla. I was inspired by the colors and the explosion of stars in the backdrop curtain. 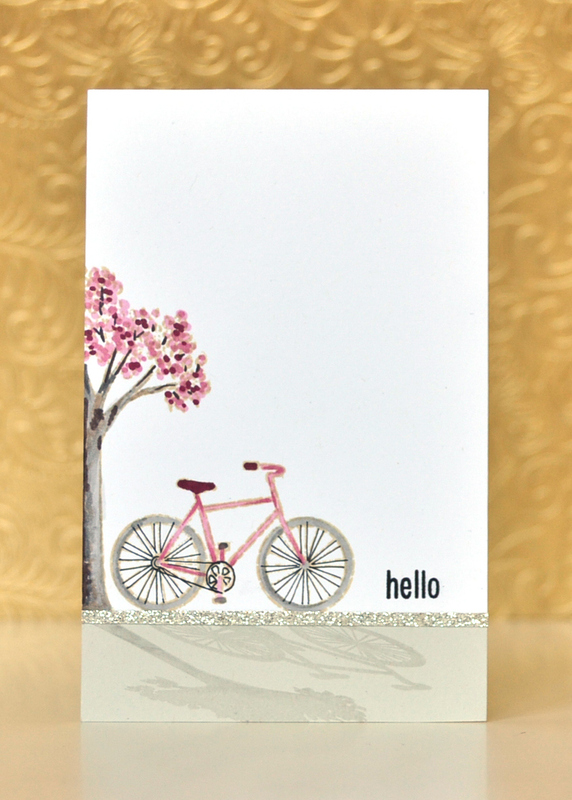 I splattered some Heidi Swapp Gold Lame color shine on to the card base. The bow is from Waffle Flower’s Bowtiful stamp set. I stamped it in yellow, covered it with glue, then sprinkled Martha Stewart’s Florentine gold glitter over it. Once dry, I trimmed it leaving a white edge. The raised panel is 2.25″ square. 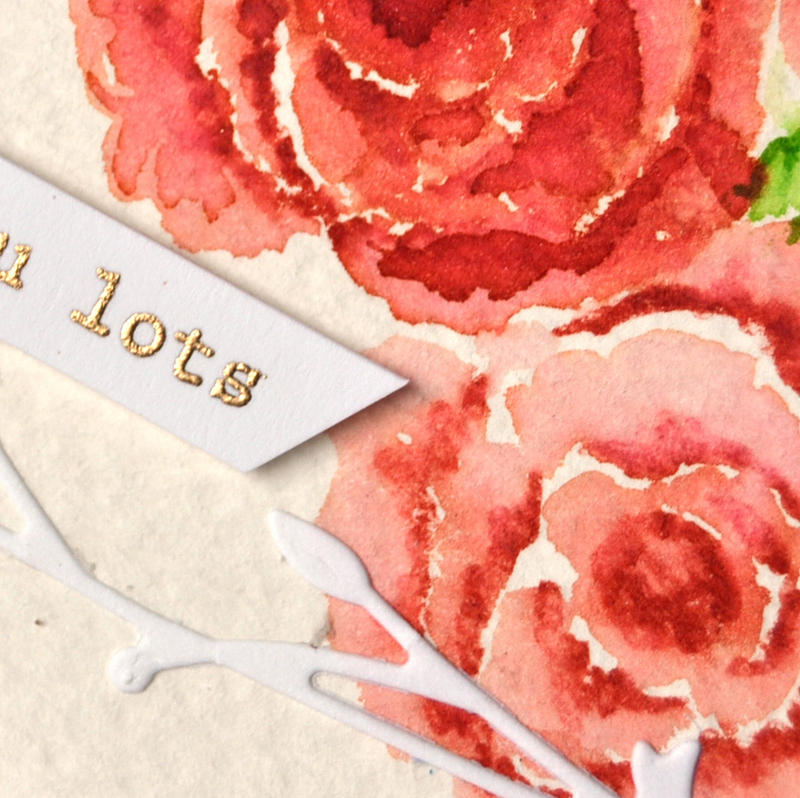 I rounded the corners, and selectively stamped one of the sentiments from the same Waffle Flower set. 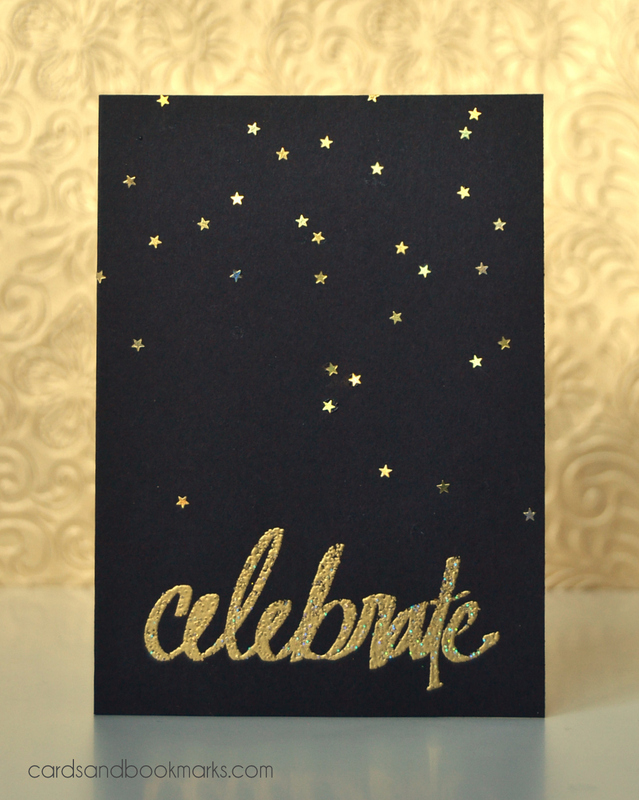 I stamped some stars on the background using Delicata gold pigment ink. The star is also from the same stamp set. Our sponsor this week is Waffle Flower, and the winner will receive one stamp set of choice from their collection. Do stop by the Runway Inspired challenge blog. You will be floored by the cards that the design team created! What a soft delicate beautiful card! My focus went straight to the gold feathers! I knew I must have a gold element in my card. I used a Stampin’Up! 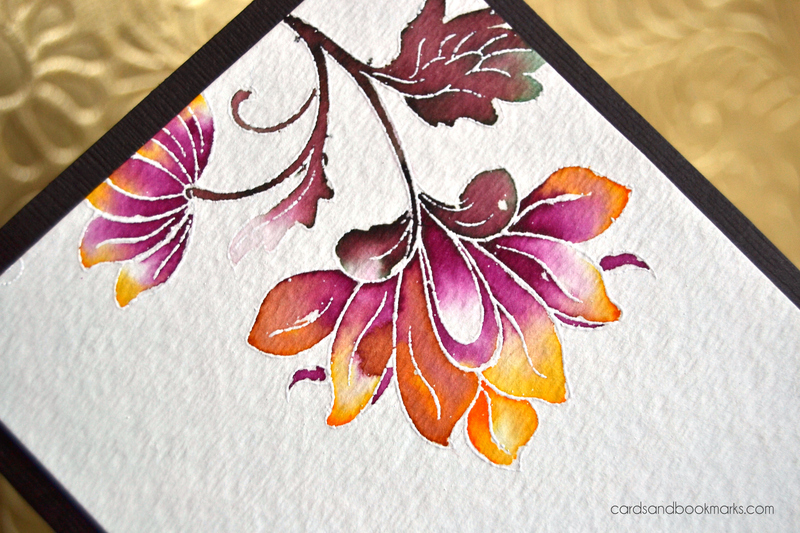 embossing folder to add texture to a water color paper panel. I used water color paper as I wanted an off-white look. I placed pearl adhesives in place of the circular ridges. For the center piece, I used a gold leather flowers embellishment with a few loops of twine. 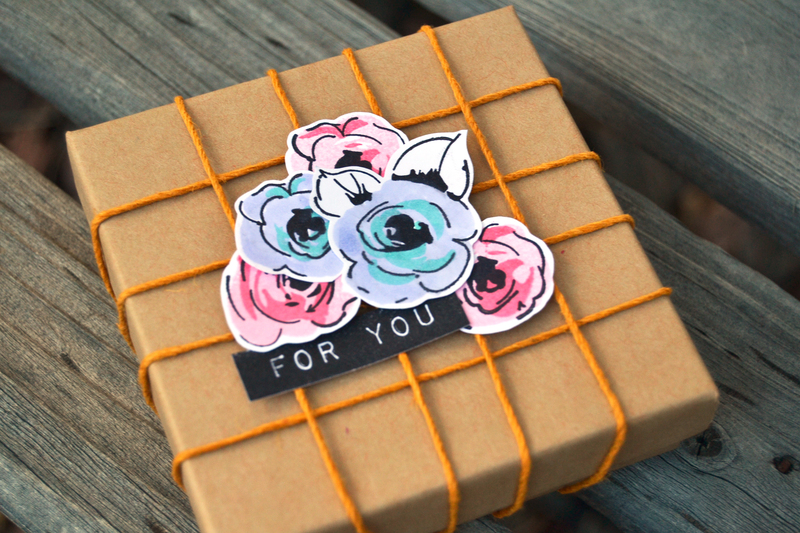 The sentiment strip was raised with foam tape, so that the flower can be tuck underneath it. Thank you very much for stopping by. Now head on over to CASE Study challenge blog and create away! This is the last challenge! 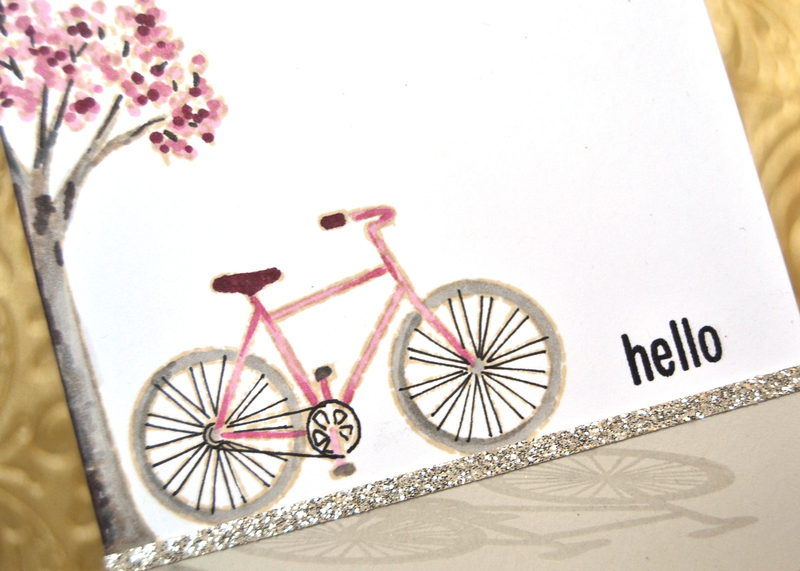 I have a card over at Simon Says Stamp blog for STAMPtember. You can read about how I made it at the SSS blog. Once again I am a little late joining at the CASE study challenge. My little vacation this past weekend left me with a lot of work to attend to. I white embossed some feathers on vellum, then trimmed around them. I adhered the feather to the box using tape runner, then embellished with some pearls. The vellum strip is a band that goes around the box. Stop by the CASE Study challenge blog and check out the fabulous projects that the design team created. I hope you will feel inspired to create something! I am posting a little late for the next Runway Inspired Challenge. I wrapped twine around the box, and then layered some flowers on top. The pink ones were stamped in three layers, and the purple/blue ones were colored with Copic markers after stamping the outline layer. After I was done, I realized it wasn’t a very good idea to wrap the twine around the closed box! Next time I will just decorate the lid, so the recipient won’t have to dissemble the whole design in order to open the box! Stop by the Runway Inspired Challenge for some fabulous inspiration from the design team! I hope you can play along. Our sponsor this week is the ever-so-sweet Ellen Hutson, and the winner will receive a $25 store credit to her online store! Today’s post is a little different than usual. I don’t have a card to share, but instead, I will be answering a few questions regarding my crafty side as part of the “Getting to Know Me” blog hop. I was nominated by the lovely Asty Purbasari to join the hop. Asty makes beautiful and inspiring projects. Did you know that she participated in the 2014 Gallery Idol?! If you haven’t been to her blog, you should definitely check it out. At the moment I am working on dressing up these gift boxes. I am at a wedding/family reunion far from home, and being the procrastinator that I am, I didn’t prepare these ahead of time. Instead, just as we were about to leave for the airport, I grabbed some crafty supplies and stashed them in my backpack. Most of the gift boxes I worked on have already been given away. I have three more to go, and I will make sure to take a picture when these are done. It is quite fun and interesting to work with minimum supplies. The scarcity of resources get those creative juices running! Apart from these gift boxes, I am also working on some new designs for our next Altenew release. What method/process do you apply to each of your creative project, and how long does each project take to complete? I almost always create an image in my mind of a design before I execute it on paper. Sometimes they turn out exactly as I envision them, and sometimes I have to play around until I am satisfied with the end result. I always try to add an interesting element to my designs that is fresh and unique. When I first started designing, my projects took anywhere between half an hour to half a day! I took my leisure time making intricate embellishments and elaborate designs. As my responsibilities grew and time became hard to come by, I gravitated towards time efficient designs. I try not to spend more than an hour or two on one project. Occasionally I do make a time consuming project, like this card I made for the Geometric Menagerie Focus post. I spent hours cutting those tiny triangles from Metal sheets, but I did it over two sessions. I think my signature style is clean and elegant. I like to try other styles too, but either fail miserably, or it takes me way too much time before I am satisfied. What three crafting tools/products can you not live without? Kelly Griglione. When I first visited her blog, I was in awe! This girl can create!! Her talent and design perspective is unparalleled. As some have mentioned before, she is truly a card making engineer. With my background in engineering, there is no wonder that I appreciate and admire her work 🙂 I also love how she uses vintage elements in her projects. These three ladies have agreed to continue on the hop, so make sure to visit their blogs next Monday and get to know more about their craft life. Ok, I decided to stop at 10, otherwise this list would never end! I started with a plain Kraft box. To add texture, I drew a plaid pattern with Versamark marker, and heat embossed it with clear embossing powder. Next I wrapped and tied the box with black twine. Finally, I added the floral embellishments and the tag. 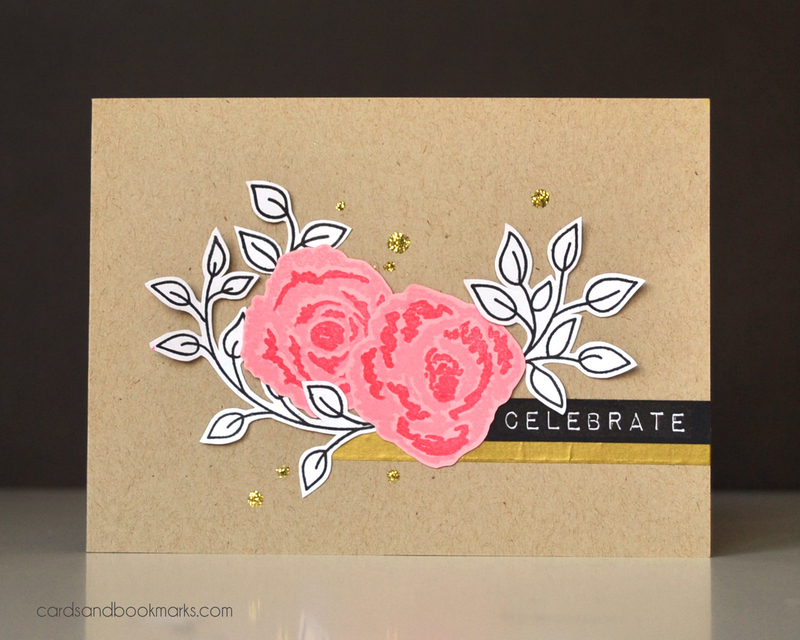 The flowers are from the Hennah Elements set, and the tag stamp/die is from Avery Elle’s Simply Tags set. Stop by the CASE study challenge blog for more inspiration. 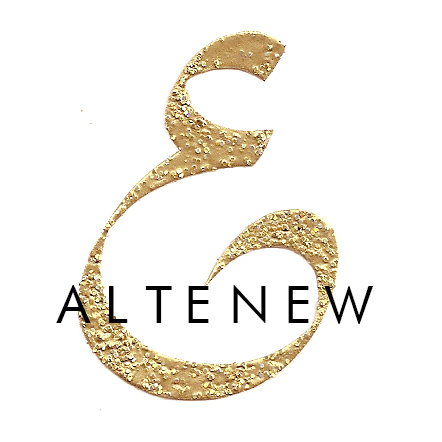 I am honored to mention that Debby designed this card for Altenew. Simply gorgeous, isn’t it? Back in July I had shared a water color technique at Ellen Hutson’s the CLASSroom. I wanted to explore that technique with embossed outline images. 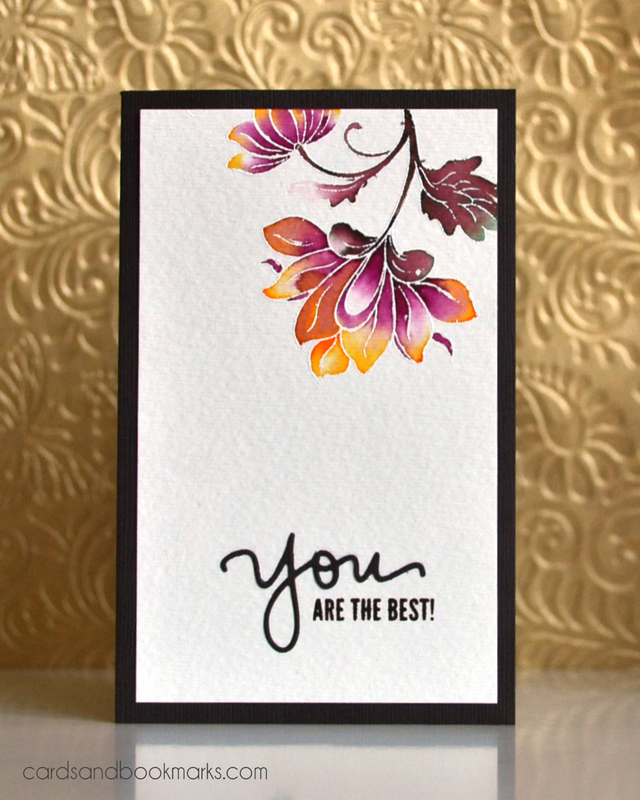 The embossed outlines keep the water from mixing between petal, and it makes achieving this look so much easier! No more waiting for some parts to dry before painting other parts! I used Peerless water colors which give beautiful intense colors. The stems and the leaves are however colored with a brown dye ink, as the Peerless palette didn’t have a brown color. The die an sentiment stamp is from Simon Says Stamp. Stop by the CASE Study Challenge blog to see how everyone else was inspired. Debby has a beauty in store for you! I almost forgot that there is a new Runway Inspired challenge today! I was inspired by the floral pattern of the top. The colors are an interesting combination. I used a flowers set by Hero Arts to stamp and color using Copic markers. 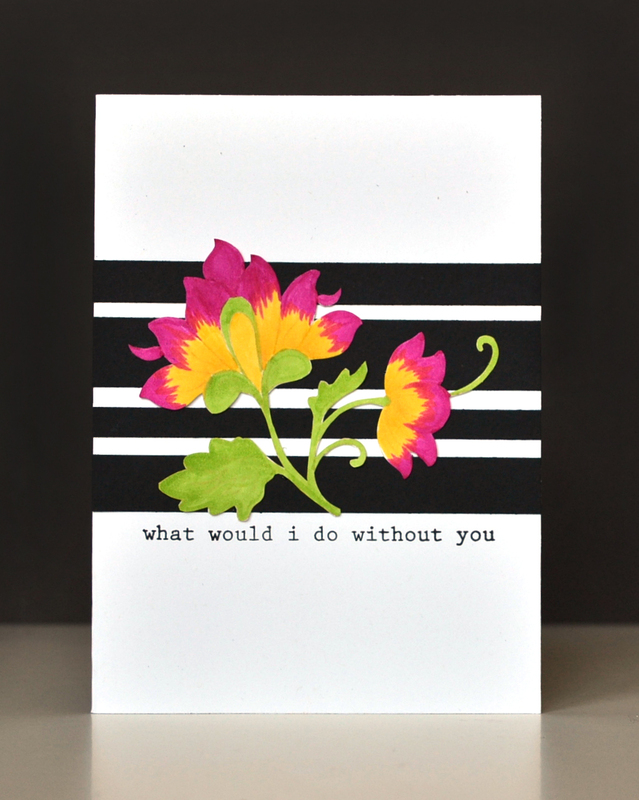 The solid flowers are stamped using Hero arts Passion flower and Fresh Peach inks. I added dots of green to fill in the empty spaces between the flowers. This week’s sponsor is Simon Says Stamp, and the prize for the winner is a $15 gift certificate to their online store. Make sure to stop by the Runway Inspired Challenge to see how the design team were inspired. It’s the third blog hop celebrating CASE Study‘s 4th year celebrations, and I am your first stop! 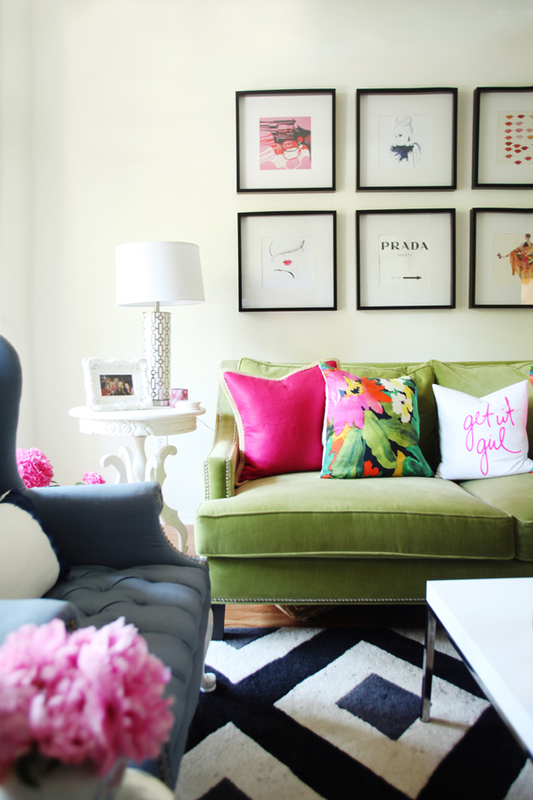 I was inspired by the floral image in the center pillow, and by the bold pattern on the carpet. I stamped one of the images from Altenew’s Persian Motifs using Distress ink Antique Linen, then colored it using Copic markers (RV09, Y15 and YR25). I trimmed the image and adhered it atop stripes of black card stock which were already adhered to the card base. The sentiment is from Altenew’s Scribbled Flowers. A very quick and simple card. Your next stop on the hop is Barbara Anders. Make sure to leave a comment at each stop to be eligible for a prize. You have until midnight Tuesday August 26th to leave your comments. Altenew is sponsoring this week, and the prize will be two stamp sets of your choice! This dress immediately reminded me of Altenew’s Sketchy Rose set, so I decided to use that in my card. 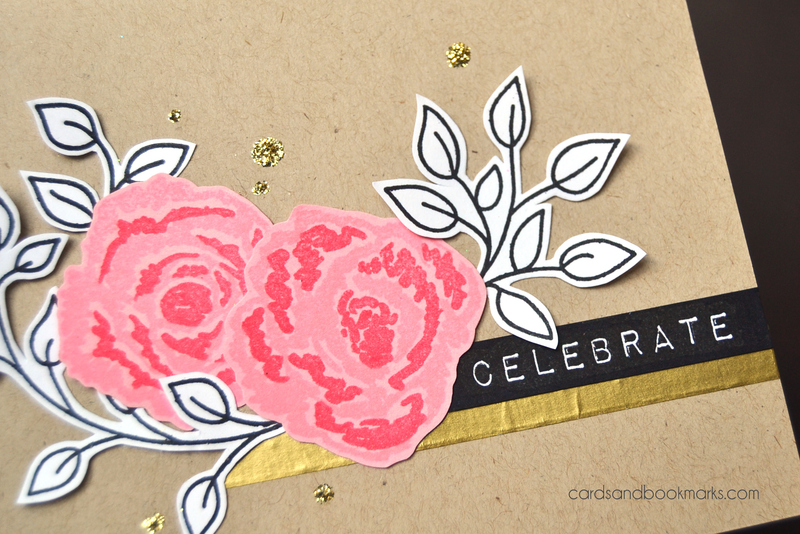 I stamped the Rose on pink card stock using SU! 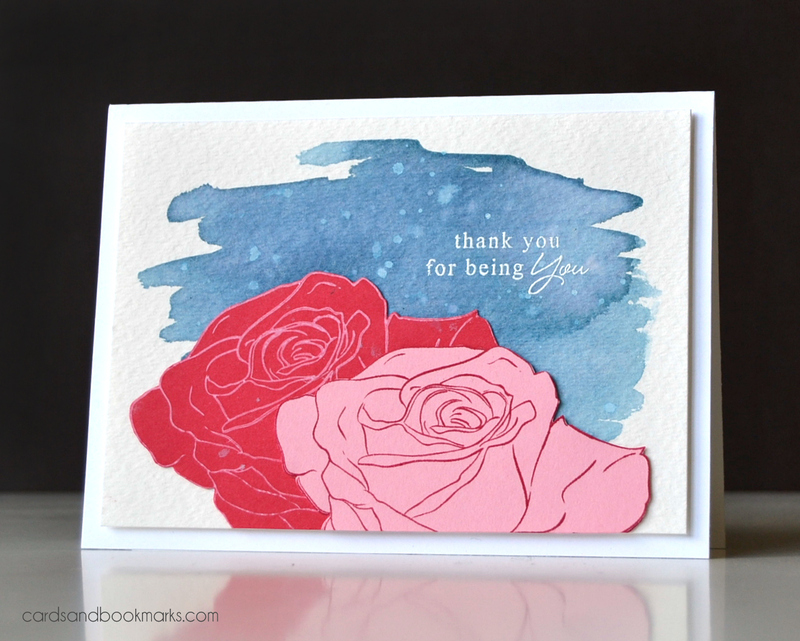 Rose Red ink, and stamped it on red card stock using Colorbox white pigment ink. I created the water color back ground using Distress ink Faded Jeans, and after it was dry, splattered some Dylusion White Linen ink spray. Our sponsor this week is Ellen Hutson, and the winner will receive a $25 gift certificate to her online store. Stop by the Runway Inspired Challenge to be inspired by some fabulous projects created by the design team. Enjoy! Guest Designer at Darlene’s blog! Today is a very important day, for I am guest designing over at Darlene DeVries’s blog! 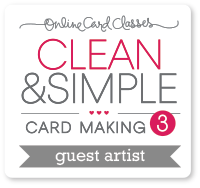 For those of you who haven’t heard of her, she is an incredibly talented card maker, and she makes great video tutorials. I learned most of my card making techniques from her when I was just beginning to design cards. In fact, I was inspired by her to start this blog in the first place! 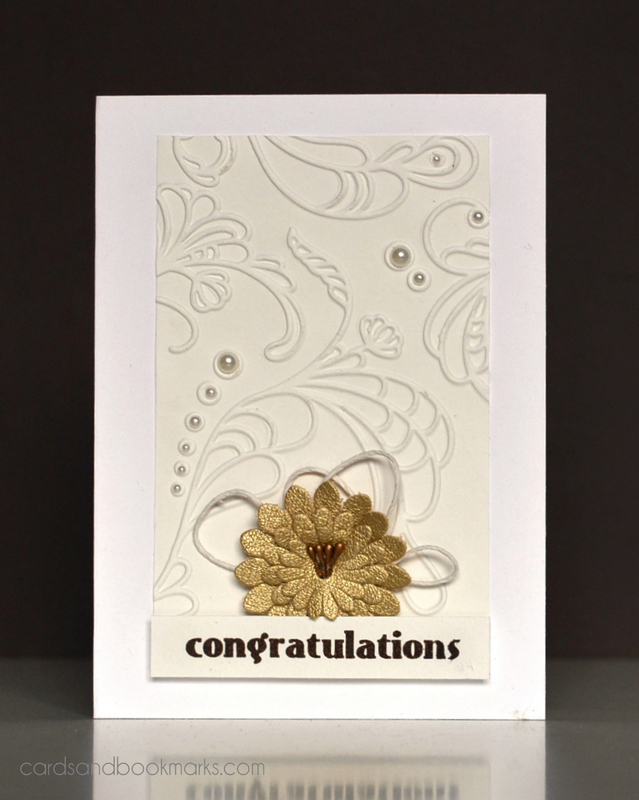 Head on over to Darlene’s blog to see the full card, as well as a video tutorial on how to make it.